2. 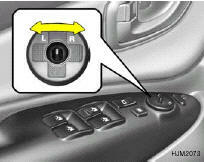 Adjust mirror angle by depressing the appropriate perimeter switch as illustrated. Be careful when judging the size or distance of any object seen in the passenger side rear view mirror. It is a convex mirror with a curved surface. Any objects seen in this mirror are closer than they appear. 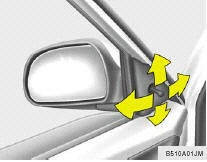 To fold the outside rearview mirrors, push them toward the rear. 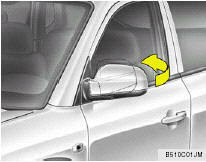 The outside rearview mirrors can be folded rearward for parking in narrow areas. Do not adjust or fold the outside rearview mirrors while the vehicle is moving. This could result in loss of control, and an accident which could cause serious injury or death.